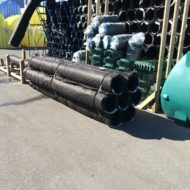 Stocking distributor of Advanced Enviro-Septic Type 2 treatment pipe by Presby Environmental of Whitefield, New Hampshire. This system, certified by NSF and BNQ, is totally passive requiring no pumps, controls or any power. We even have a mechanical dose counter option installed in a small floating outlet (Flout) dosing tank which also needs no power or batteries. The system requires a pre-tank sized to 2x the daily flow. The 12″ dia. x 10 ft. pipe lengths and endcaps snap together with no tools required. See schematic attachment & Enviro Septic Brochure. Let us know if you would like us to send you a complete design and installation guideline. Installing these systems requires factory certification which can be obtained online through Presby University. Come by our plant and check them out.